The wine industry provides a great backdrop for movies. Films centering on the wine industry range from the comedy/dramas, such as the humorous Sideways and the based-on-a-true-story Bottleshock, to documentaries, such as the controversial Mondovino and the recent SOMM. Now a new film is scheduled to open on August 16th that sets itself in the prestigious vineyards of Saint Emilion, France and tells the story of a family in the wine business. 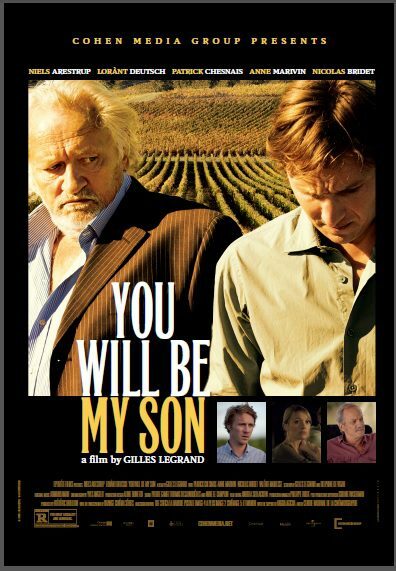 YOU WILL BE MY SON, directed by Gilles LeGrand (Micmacs, Malabar Princess) is a family drama that focuses on the problematic relationship between the vineyard owner Paul Marseul (Niels Arestrup), and his son Martin (Loran Deutsch), who works with him on the family estate. The synopsis is that Paul is a demanding and passionate winemaker but is a domineering father. He is not happy that his son may one day succeed him. He dreams of a son who is more talented, more charismatic and more in line with his own aspirations. Things deteriorate as Paul’s trusted manager Francois (Patrick Chesnais) is dying of cancer. When Francois’ son Philip (Nicolas Bridet), also in the wine business, returns from California to look after his father, Paul sees Philip as his ideal son and turns away from his own flesh and blood. Watch the Trailer Here Now! Based on the trailer, this emotional and touching story of a dysfunctional family set among the romantic backdrop of the French vineyards and the great wines, makes this a beautifully powerful film worth seeing. I am looking forward to seeing the film when it opens August 16th in selected theaters and hope you will too! This entry was posted in Lifestyle, Wine and tagged France, Gilles LeGrand, Loran Deutsch, movie, Nicolas Bridet, Niels Arestrup, Patrick Chesnais, Saint Emilion, Wine, You Will Be My Son by Allison Levine.